StockTickr: Tell us a little about yourself, Eddy. Eddy: I’m Eddy Elfenbein, an investor and financial blogger based in Washington, DC (our nation’s capital – woo!). Eddy: When I was a kid, I had saved up some money and my father recommended that I buy a stock. I wasn’t sure what the stock market was but I knew it was where rich people hung out so I went for it. Ugh, it was a horrible experience. The stock my father recommended dropped immediately. I was the first 12-year-old in history to get the high print on a trade. I’m not sure whatever became of the stock. I think it’s still traded on the pink sheets in Ecuador, but I’m not really sure. Eddy: I have many. Mark Twain said that good judgment comes from experience, and experience comes from bad judgment. Well, that’s me. When I got a job as a sales assistant, the branch manager used to do these daily “sales reports.” This guy was sorta like Bill Lumberg but with less social skills. One day, he recommended that all the brokers start selling Atmel, so I decided to buy it. Naturally, it plunged like a rock. I convinced myself that it was about to turnaround around any day now, so I kept averaging lower. And lower, and still lower. Now when I hear people say “this stock’s at $3, how much lower can it go?” I tell them, ZERO – that’s how low it can go! I can go to Blutarsky – zero point zero. Three dollars to zero is the exact same distance as $500 to zero. StockTickr: Describe your style of trading. How long do you typically hold stocks? Eddy: I’m one of the last buy-and-hold guys. On my blog, I have a Buy List of 20 stocks that I track. I change the list just once a year. Once it’s set, I can’t touch it for the entire year. This year, I only made five changes, which was the last as last year. That implies a four-year holding period. 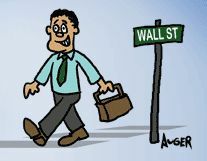 StockTickr: What’s your exit strategy for winning and losing trades? Eddy: There’s nothing really scientific. I sell if I think the stock has gotten too high, or the fundamentals start deteriorating. I place a lot of emphasis on consistency of results. If you look at the long-term big winners on the stock market, it’s been the companies that have consistently churned out profit increases. StockTickr: What 3 books do you recommend traders read? For investors, I first recommend they read all of Warren Buffett’s Chairman’s Letters. StockTickr: Other than your own, what are your 3 favorite blogs? Eddy: The big change is that long-term interest rates are now so low that the expected return on equities is probably around 7% to 10%. I don’t think most people realize that, but they’re going to learn it. It really hasn’t affected how I invest, but it’s more of a change in mindset. Eddy: I wouldn’t call what I do “back-testing,” but I look for stocks that have long histories of continuously delivering strong earnings growth. There aren’t many. A good example is Stryker, the orthopedics company. The old CEO made the company’s goal to increase EPS by 20% a year. What’s scary is how often they’ve done it. Eddy: Remember that the stock doesn’t know you own it. In fact, if it did, it still wouldn’t care. Between ignorance and apathy, you’ve got your bases covered. Say you bought a stock at $40 and it drops to $30, most new investors will stay forever in a lousy position because they don’t want to “take the loss.” Don’t let your emotions get the better of you. If things at Starfleet never worked out, Mr. Spock would have made a great trader. StockTickr: When did you start your blog and what prompted you to do so? Eddy: My first post was in July 2005. My initial motivation was to track my own picks. I wanted to see if I could publicly show people that the stock market can be beaten. My Buy List is free and open for all the world to see. Over the past three years, my blog has grown and grown. I thrilled everyday to get e-mails from investors all over the world. Get a free trading performance review using StockTickr – hone your trading edge and become consistently profitable with StockTickr.